Health Being Institute & College of Medicine invite you to the first of a series of events exploring Harmony in Health. Mythology, history, philosophy, medicine & spirituality combined in this multidimensional workshop. Harmony, ΑΡΜΟΝΙΑ, means to join, to combine contrasted elements. Everything is connected with everything else. Our health depends on our inner & outer environment. When we live in harmony with our environments we enjoy a happy and healthy life and, we influence the world through conscious & unconscious, obvious & subtle processes! to have a healthier, happier and more fulfilled life, to live as a harmonious human being. at the Health Being Institute in 8-9 Hop Gardens, Woolman Room, London WC2N 4EH. Dr Eleni Tsiompanou is the College of Medicine Ambassador in the Harmony project. The Harmony Project was originally inspired by HRH, The Prince of Wales’s book Harmony: A New Way of Looking at Our World, which reminds us of some profoundly important truths, namely that everything in the universe is connected and balanced by universal laws and relationships. 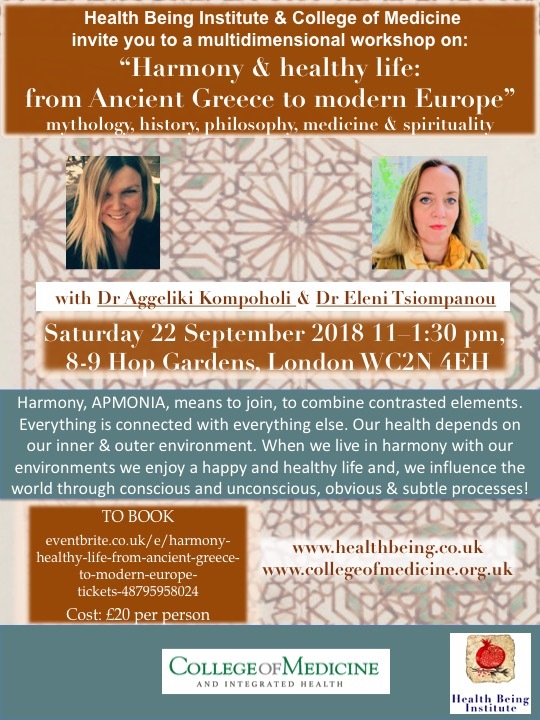 Dr Aggeliki Kompoholi has an in-depth knowledge of Ancient Greek language, mythology and philosophy and, a skill in bringing this timeless wisdom to life, making it relevant to our everyday world. For her research work she has been honored by the Academy of Athens. She has published papers in many peer-reviewed journals and has participated in Greek and international conferences. For the last twenty years, she has been teaching and exploring the possibilities of implementing ancient Greek philosophy in our everyday personal, professional and social life. 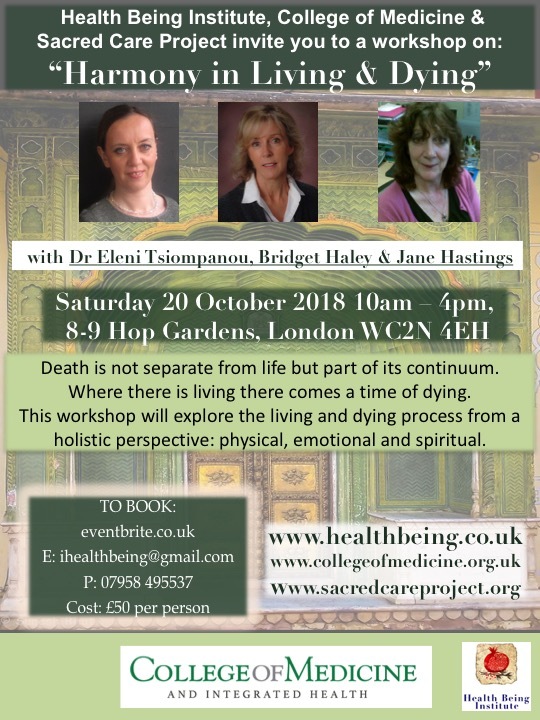 Health Being Institute and the Sacred Care Project, in association with the College of Medicine invite you to an innovative workshop on harmony and the process of living and dying. Tea will be provided. Please remember to bring some lunch with you. Alternatively there are plenty of places nearby to get a snack during lunchtime break. 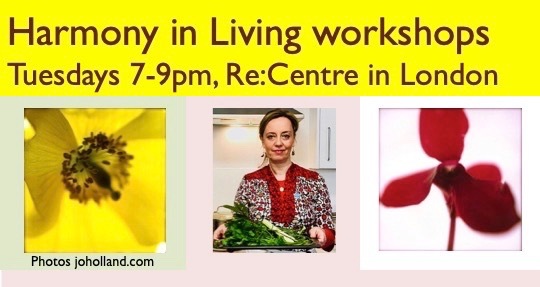 By popular demand, following our first sell out workshop on ‘Conscious living – Conscious Dying’, we dedicate this whole day event on the process of living and dying. Everything is connected with everything else. This connectedness and the blending of contraries, such as life and death are attributes of Harmony. Discover through the prism of Harmony how human beings are part of the natural world and death is a natural and sacred event. Living and dying are a continuous circle and, as Hippocrates wrote 2,500 years ago: ‘nothing comes into being that did not exist before’. Explore how our way of life may influence how we die. Most people have very little chance to witness death and dying during their life, as this is usually managed by professionals. It is however a natural process that needs not to be feared or talked about in hushed voices. Demystify dying by learning about the physical, emotional and psycho-spiritual aspects of it. Learn how to support those who are in the last stage of their life and, after death, how to be with those who are left behind. Dr Eleni Tsiompanou is a Palliative Care Consultant physician whose experience has taken her from the clinic and laboratory to creating the Health Being Institute. She feels that through a gentle awakening to the reality of our mortality we can transform our suffering, fears & isolation and access the miracle in our daily lives. Bridget Haley has been a nurse and longtime caregiver. She began the Sacred Care Project in 2015 in response to the fear and unpreparedness she witnessed many times when caring for the dying and their families. She feels that with the right guidance and support we can be part of this very natural holistic process in a helpful, healing way, a sacred way. Jane Hastings worked as a nurse in intensive care and palliative care for more than three decades. Now that she has retired, she is passionate about engaging with people to help demystify death and support them to understand the process of dying.